The dashboard provides a visual overview of the data and can be explored by the areas of life (domains) or by the direction of change. It supports the Measuring National Well-being programme which provides a more detailed look at life in the UK. We describe well-being as “how we are doing” as individuals, as communities and as a nation, and how sustainable this is for the future. The full set of headline measures of national well-being are organised into 10 areas, such as health, where we live, what we do and our relationships. The measures include both objective data and subjective data. For more detailed information, the national well-being measures dataset contains the latest data, back series, demographics where applicable and quality information. We assess change over the short-term (mainly 1 year) and the long-term (mainly 5 years). Change is assessed over a 5 year basis in the dashboard below, however trend information can be found below in the graphs for each indicator. 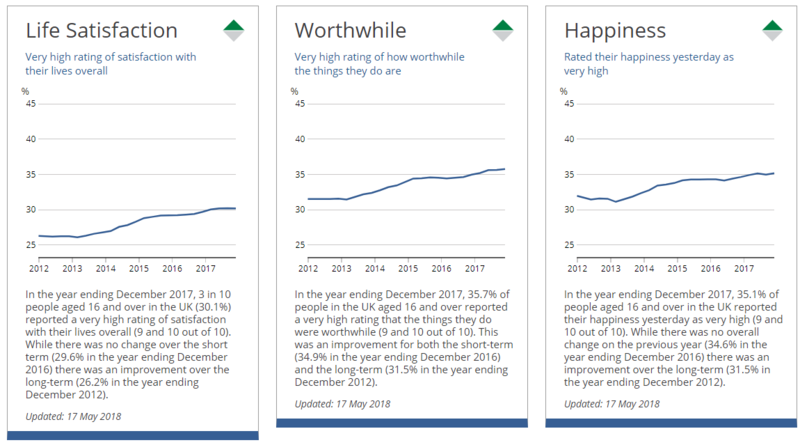 The latest update provides a broadly positive picture of life in the UK, with the majority of indicators either improving or staying the same over the long-term. Areas of life that are improving include: our personal well-being, for example our life satisfaction and happiness, satisfaction with our leisure time and income and getting by financially. However, two areas deteriorated over the long-term – having someone to rely on and satisfaction with our jobs.